US sub-machine gun M3 Grease Gun. The American M3 ‘Crease Gun’ was the equivalent of the British Sten, German MP40 and Russian PPSh, for it was designed for mass production. It was a sound enough weapon but the US troops never really took to the type, preferring the expensive Thompson sub-machine gun. When the United States entered WW2 the only sub-machine gun available was the Thompson, and there were not many of those. Numerous potential designs were examined and tested without producing one which showed any marked superiority, and in October 1942 it was decided to start with a clean sheet of paper and design a completely new weapon. The design was inaugurated by the Small Arms Development Branch of the US Ordnance Corps Technical Division, and right from the start the importance of simplicity of production was well to the forefront. 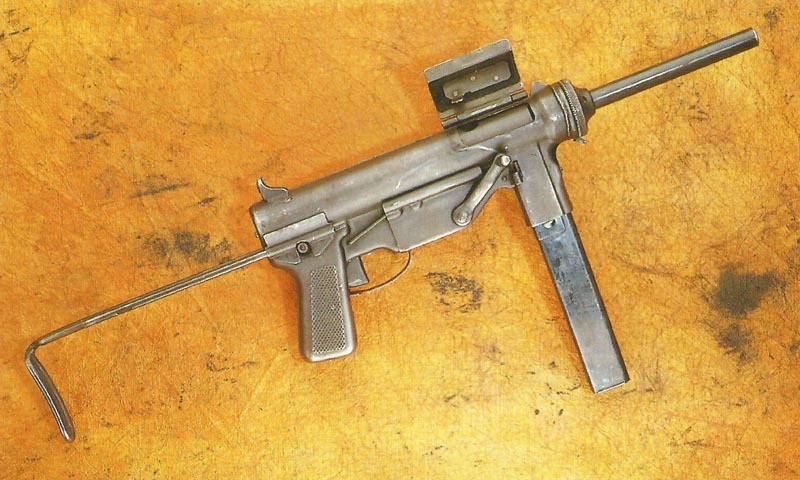 The first prototype, the Machine Pistol T15 was capable of single shot or automatic fire, but the single shot facility was dropped to turn it into the T20. This was tested in late November 1942 and found favor in the eyes of potential users, so that on Christmas Eve 1942 it was formally approved as the Sub-machine gun M3. US M3 sub-machine gun, fitted with a silencer. Unpopular with its users in Europe, the ‘Crease Gun’ gained acceptance in the Pacific. 3D model of the M3A1 Grease Gun. The design was relatively simple, and from its shape it came to be called ‘The Grease Gun’. The barrel projects from the front cap of a cylindrical body, the ejection port is covered by a hinged flap, the pistol grip is, as the rest of the weapon, of steel, and a simple collapsible wire stock is fitted. Cocking was performed by a crank on the right side and was one of the less successful features; another was the design of single-column magazine which inevitably gave stoppages and misfeeds throughout the gun’s life. One very ingenious feature was the provision of a conversion kit of barrel, bolt and magazine adapter whereby the normal .45 gun could be rapidly converted to fire 9mm Parabellum ammunition, feeding from a standard Sten magazine. For all its faults – which were really minor – the M3 did what it set out to do: provide a cheap and efficient weapon which could be stamped out by the thousand in a short time. Over 606,000 of them were made at an average cost of about $25 (£5.30 at the then-current rate of exchange) each. Variant M3A1: In January 1944 there were complaints from various users that the cocking crank mechanism was beginning to exhibit defects due to wear, and an investigation showed that the whole of this complicated apparatus could be done away with by adopting an outstandingly simple system. Instead of the usual lever or knob, a large hole was drilled in the bolt into which the firer inserted his finger and pulled the bolt back. To permit this, the ejection port and its cover was extended rearwards. Other small refinements to aid production were incorporated and the resulting weapon entered service in December 1944 as the M3A1. Over 15,000 were produced before the war ended, at a cost of $22 each, and in later years another 33,000 were made.